In 1999, Arena Sports (Seattle, WA) started Lil’ Kickers with the goal of building a kids’ program that was fundamentally sound and outrageously fun. Using world renowned child development theories, child development professionals, experienced coaches and the expertise that comes along with thousands of hours of working with children, Lil’ Kickers created a curriculum that introduces kids to soccer and so much more. A program was created that helps develop a child’s social, emotional, and cognitive skills while providing physical exercise and developing players who are good sports and good teammates — on and off the soccer field. The Arena Sports Lil’ Kickers program has now grown into a national franchise with more than 130 locations in 32 states and now in Canada with an enrollment of over 400,000 kids and growing! 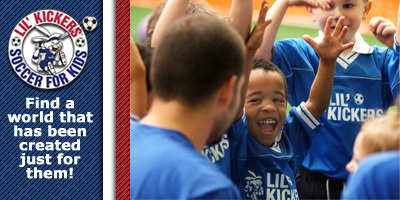 In 2005, Lil’ Kickers NWI began hosting classes at Soccer City Palatine. The Program immediately took off with 400 kids enrolled in Winter 2012. Since then we have expanded into the Lake Barrington and Lake Zurich areas with two satellite locations.